Nothing we use for a few minutes should threaten our health and pollute our future for hundreds of years. Every day, people throw away tons of plastic “stuff” — cups, plates, bags, containers, forks, knives, straws, spoons and more. All of this waste not only clogs our landfills, trashes our parks, and litters our streets, but it also washes into our rivers and oceans, where it can harm wildlife. It’s time to move beyond single-use plastic, by getting rid of the most harmful waste, and stopping the use of things we truly don’t need. Americans throw away an estimated 25 billion polystyrene cups every year, or about 82 cups per person. Americans use 175 million straws daily, almost enough to circle the globe! Plastic bags are only used for 12 minutes on average, and yet plastic persists in the environment in tiny particles for hundreds of years — and every bit of it ever made is still out there. Plastic foam bans have passed in more than 200 cities and counties, from Portland, Oregon to Portland, Maine. Some companies are also getting with the program. Both McDonald’s and Dunkin’ have committed to phasing out foam cups and containers worldwide. Scientists are still documenting the scope of plastic pollution and investigating its effects. 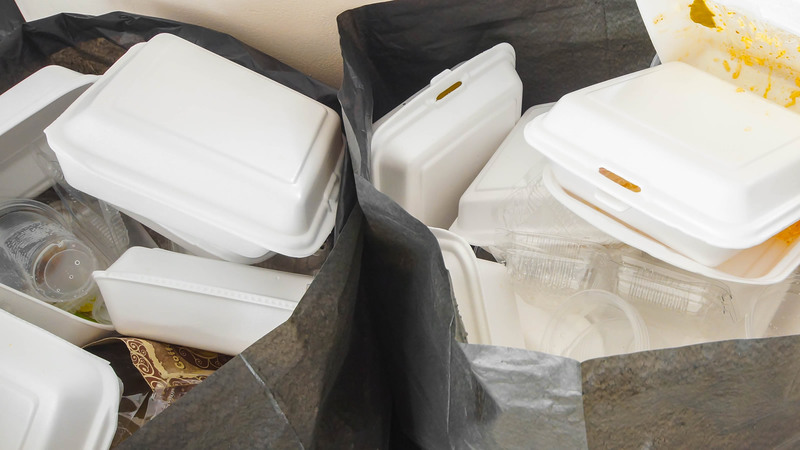 But for decades we’ve known that one of the worst forms of plastic pollution is polystyrene foam, the kind used in foam cups and take-out containers, which most of us call Styrofoam. Polystyrene foam is made of fossil fuels and can’t be recycled. It breaks apart easily, but it takes hundreds of years to fully degrade — which means that every piece of foam ever made is still out there and will continue to pollute our planet for hundreds of years to come. Once found mostly in soda fountains of the 1930s, straws have become one of the most ubiquitous unnecessary products on the planet. Americans use 175 million straws daily, almost enough to circle the globe. Compounding the problem, plastic straws are small, thin and bend easily, so they fall into the cracks and crevices of recycling machinery. Therefore, most recyclers do not accept plastic straws, and most straws that do make it to a recycling facility do not get recycled. A plastic bag is used for an average of 12 minutes, but can persist in our environment, and pollute our communities, for generations. Last year, 50 percent of the bags we used ended up in landfills and 8 billion ended up in the environment. Nothing we use for a few minutes should threaten our health and pollute our future for hundreds of years. It’s time to ban the bag. Our national network is working on introducing and passing bills that would help move our country beyond single-use plastics. In 13 states we have introduced legislation that would ban single-use polystyrene take out containers. In seven states, we are working on policies that would make straws available by request only, and in 10 states we have efforts underway to pass statewide bans on single-use plastics bags. We’re partnering with Environment America. Over the years we’ve worked together to win similar efforts to reduce waste and plastic pollution. From our work on state bottle bills in Massachusetts and across the country, to pro-recycling laws and the first statewide plastic bag ban in California. We know how to combine professional research and advocacy with citizen support, to win real results. MontPIRG is calling on our decision makers to lead us toward a zero waste future by passing a statewide ban on polystyrene take-out containers and enacting policies that would make straws available only upon request. Our national network is partnering with Environment America, over the years we’ve worked together to win similar efforts to reduce waste and plastic pollution. 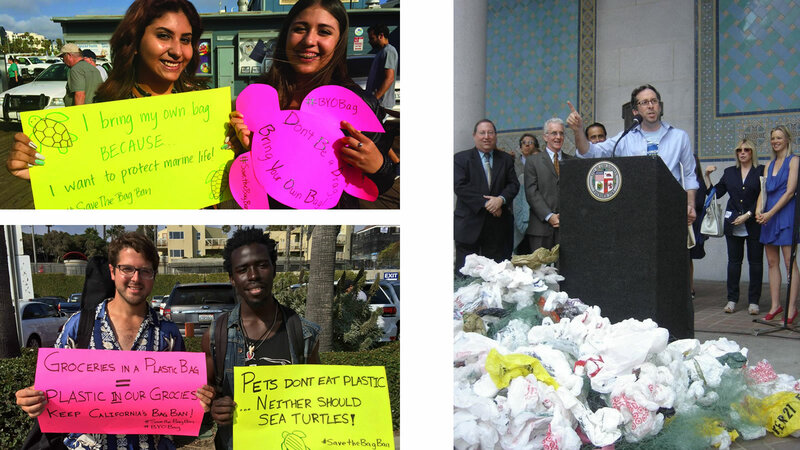 Recently California passed the first statewide plastic bag ban in the country. Of course, there are plastics companies that don’t like this idea. In 2018, corporate opposition helped block a bill banning plastic foam containers in California. But across the country, polystyrene foam bans have passed in more than 200 cities and counties, and even some corporations like Dunkin’ and McDonald’s have indicated a willingness to phase out polystyrene, and hand out straws only upon request. One of the best ways to reduce the amount of trash headed to landfills is to ban items such as plastic foam cups and takeout containers. Tell our governor to ban single-use polystyrene items today.